Mark Kelly toasted a ‘professional’ Pompey Academy performance following his side’s FA Youth Cup second-round victory at Cray Wanderers. The young Blues delivered a 4-0 victory at Bromley’s Hayes Lane. Bradley Lethbridge, Leon Maloney, James Whiting and Oscar Johnston were all on target for the visitors. With a right to play Liverpool in the third round at stake, Kelly told his troops not to underestimate non-league Cray before the clash. 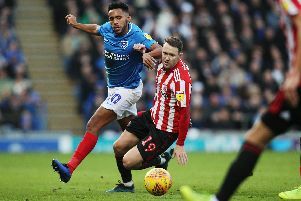 Pompey had suffered a banana skin earlier in the season when they were knocked out of the Hampshire Senior Cup by Wessex League premier division strugglers Andover New Street. And Kelly was delighted with his side’s display at Wanderers as they set up a clash with the Reds’ Category One academy outfit. The Blues’ youth chief said: ‘The performance was very good and professional. It was a bit like the first team going to Maidenhead. ‘You’ve got to be professional and the lads got the result they deserved. ‘As much as they were disappointed at Andover, they took a lot out of it because it was a step to make sure it didn’t happen again. ‘They were focused all week on the job they needed to do. Training was a little bit intense and they had that little bit of pressure on them. ‘That’s been nice because if they make the step up in their careers then that’s what they’re going to have to do. ‘There are always the cliches in the build-up (about not thinking about Liverpool). ‘We came here to perform, do our jobs and be professional – they did that very well. ‘We had lots of chances at optimum times such as when the score was 2-0 and 3-0. Cray put pressure on us because they had nothing to lose.